As is the case with almost all classical ballets in the Bolshoi repertoire, Giselle too is presented in the version created by Yuri Grigorovich rather than the more traditional version of the troupe's northern cousin, the Mariinsky. On 11 November, Olga Smirnova danced the leading role at the Bolshoi for the second time this year alongside the elegant Simeon Chudin, and Alena Kovalyova debuted as Myrtha. Despite being part of the Grigorovich brand, this version differs from the original in several respects. The primary difference is the orchestration and choreography at several points: the end of the corps section just before the peasant pas de deux in Act I, Myrtha's arabesque hops (three rather than two each time) and the direction of her steps on stage in Act II. The musical notes just before Giselle's variation in Act I are altered, and an overbearing harp string at the opening of Act II distracts from the normal emphasis on the flute. It's unclear if these changes were made at the choreographer's request or form part of Bolshoi tradition, but they aren't heard in other productions. 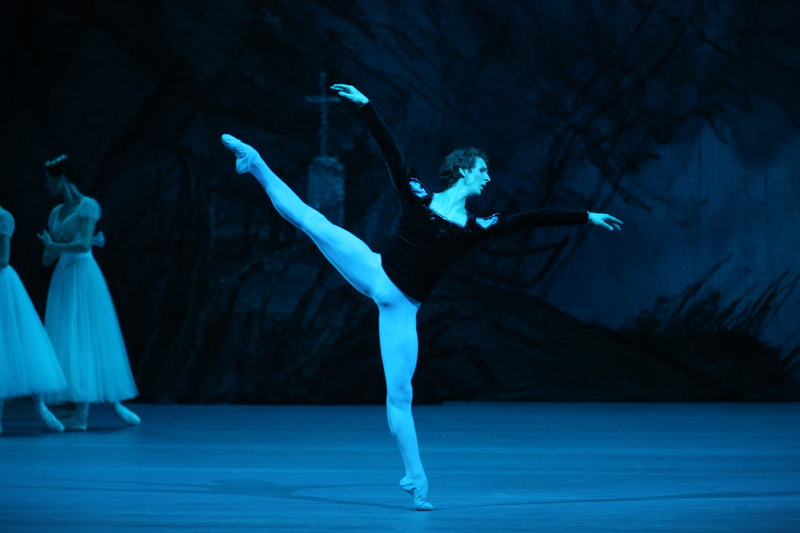 Pictured above: Olga Smirnova as Giselle. In Act I, Chudin's Albrecht entered with vibrant energy and noble bearing. From his acting, there is no indication whether Albrecht is intent on deceit, playing a game to boost his ego, or truly in love with the girl he's about to woo and, ultimately, kill. This is one of the libretto's eternal mysteries. In Chudin's case, his initial denial --pointing the figure first at Hans, then racing to the crowd of peasants, searching for forgiveness-- depicted a man unaware of the repercussions of his actions. But in Act II, with a new sense of awareness, he nodded to Myrtha after her instructions that he would die, acknowledging not only her power, but also, in a sense, his own guilt and defenselessness. Pictured above: Semyon Chudin as Albrecht. When the door to the peasant hut opened in Act I, a beautiful, meek Giselle emerged, her ballonés hanging in the air, the accent made in a coup de pied aloft rather than with the leg extended. In every respect Smirnova appeared a nod to the great Galina Ulanova, even her coiffure matching the latter's. Her shy nature was evident when she pulled away from Albrecht during his initial advances and in the tentativeness with which she approached Bathilde's skirts, admiring the rich fabric. In the mad scene, she seemed to drift into another world entirely, unreachable by anyone until the very last moment, when she seemed to see her mother and, for a split second, Albrecht, just before dying in his arms. Less impressive were the couple who performed the peasant pas. Awkward port de bras from Daria Khoklova and wobbles in the tours from Aleksey Putinsev can be fixed, but one wonders what other dancers could have accomplished in these roles. Pictured at left: Alena Kovaleva as Myrtha. In Act II, Smirnova rose from the grave a wispy spirit, eluding each of Albrecht's grasps initially, but falling softly into his arms with each subsequent lift. The partnering sequences were an essay in perfect union -- the slow arabesques skimming the floor truly made her look weightless. Impeccable turns in attitude by Chudin, and cabrioles with deep port de corps back led him into three sets of inexhaustible entre-chat six, showing the sincerity of his grief against the backdrop of incredible technique. Alena Kovaleva entered the stage as Myrtha with stern mastery, her commanding presence weakening only at moments in a few grand allegro movements, but easily overlooked given her character's statuesque presence. A fluid port de corps, glacial bourreés and assertive arm gestures underscored her power as the Queen of the wilis. The role will become Kovaleva's in due time, if only due to the utter beauty of her limbs and yes, her unusual height, which in this role, is an asset. Though alterations to traditional stagings always detract from the overall impression of a production, moments of true mastery shown through in this trio of stars -- Smirnova, Chudin and Kovaleva each have treasurable years ahead of them. Photos by Elena Fetisova and Damir Yusupov, courtesy of the Bolshoi Press Office.